I have a lot of beads. 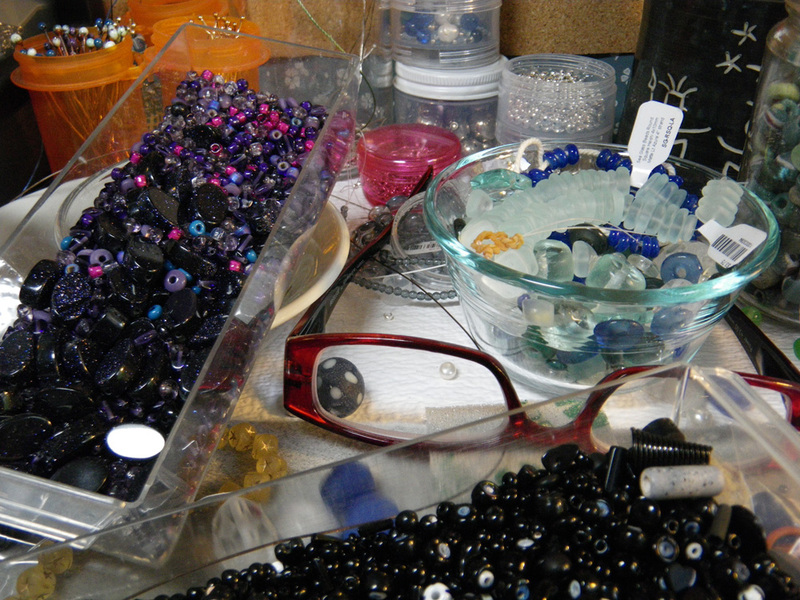 I love making my own fine silver beads to combine with beads made by others. 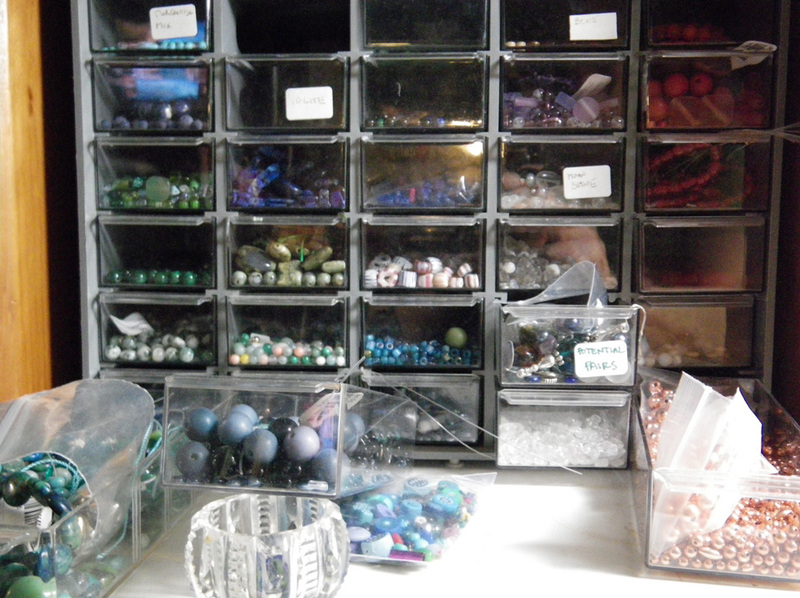 I find stringing beads quite relaxing. I never sketch my necklaces or bracelets before I make them. Instead, I take some beads that inspire me, look for color combinations I like, and string them on some wire, starting from the middle of the necklace. Sometimes I use a specific pattern and sometimes I make them asymetric. The pieces come together by trial and error. 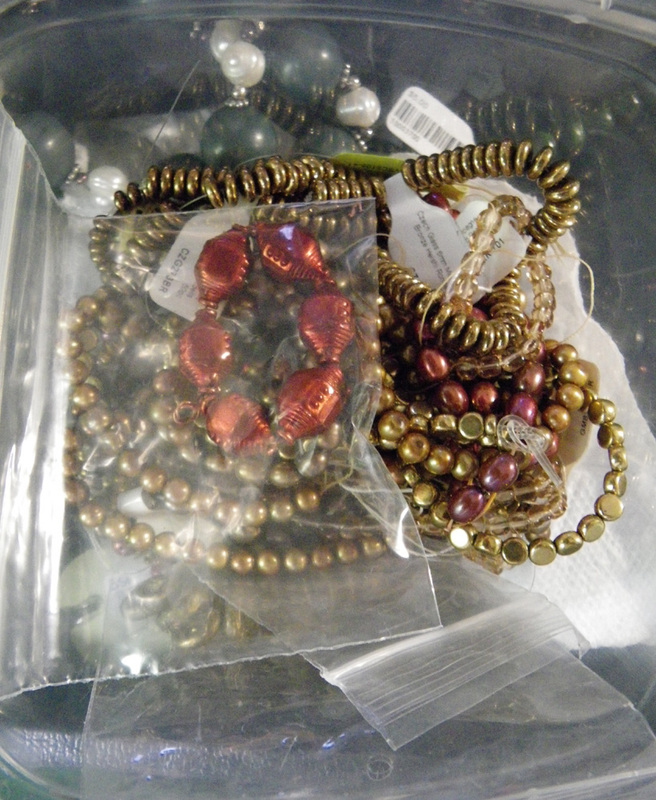 Beads on the wire – beads off the wire. 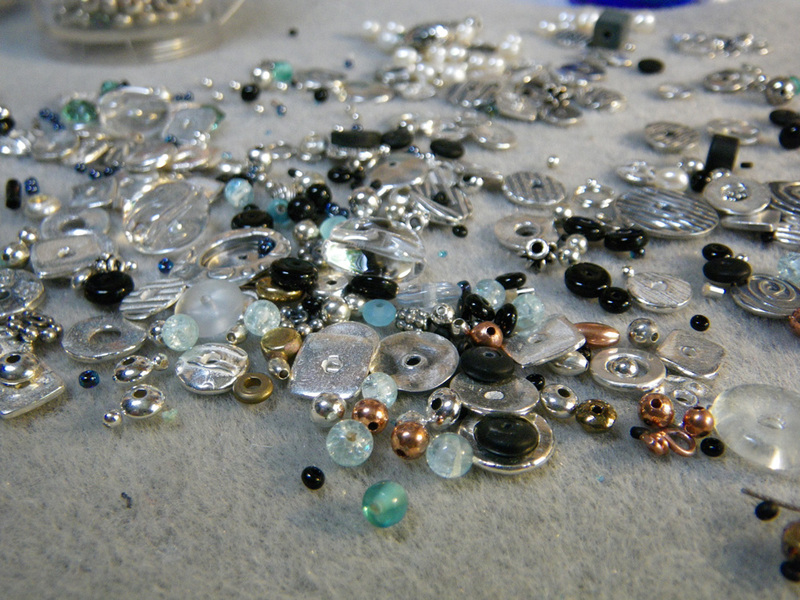 Different beads on the wire – then look for other beads to use in the combination. Inevitably, I sort all this stuff out. Either when someone is coming over to visit my studio or when I want to start a new piece with beads of a different color. that process was so much fun to “watch”! all i feel when i get my beads out is anxiety… that’s why i stick to limited size (2-4mm) and limited palette….it helps limit my anxiety. don’t you LOVE those stacking screw-jars? 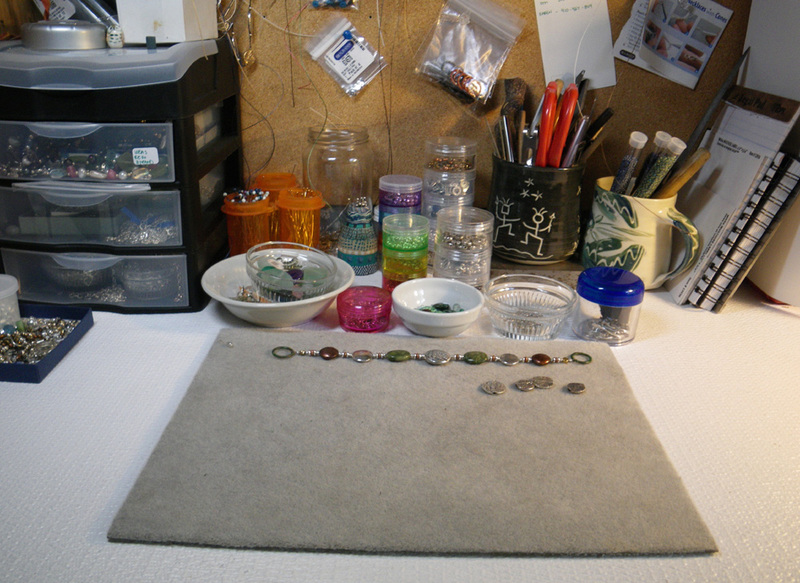 i keep EVERYTHING in them….finished pmc elements, sterling silver findings, unfired pmc elements…apparently, everything EXCEPT BEADS!!! Love those jars. Holly, your bead work always looks so free and playful. I would never know it makes you anxious! This sounds just like me! When company comes they get thrown into a basket so I can put them back on the table as soon as I get a chance. 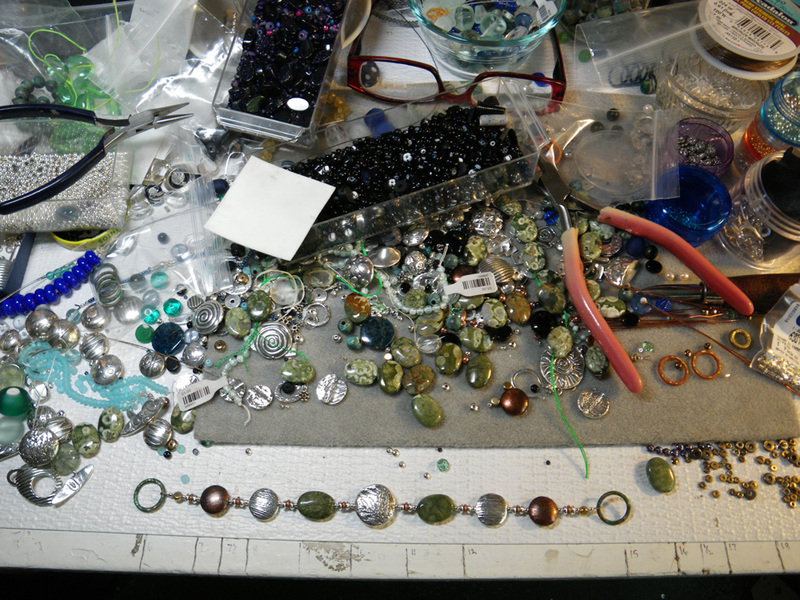 My “studio” is the dining table and area around it and it is usually taken over by my projects. People who come to dinner have to look at my stacks of plastic boxes of beads and supplies, AND the terrarium window behind where my photo setup is. my sketching consists of a drawing I make in my little notebook with details of materials colors and costs after I make my item. I have notebooks going back to 1998 and it is fun to look back and see the gradual evolution of my designs. What would we do without dining room tables for all of our stuff, and without the friends who come over for dinner, giving us a reason to clean it all up? !